The Wasco School, built in 1916, was recently saved from demolition to serve as a community center. In Wasco, a town of 400, there’s a new sign of transformation: pickleball. The all-ages paddle sport is so popular the Wasco School Events Center is adding additional courts to keep up with demand. The game draws some of the largest crowds to the Wasco School Events Center, says Melissa Kirkpatrick, the center’s director. “Our Fitness Center has over 30 members,” she says. “Pickleball is so popular we’re adding another net.” There’s new life at the 103-year old Wasco School, and pickleball is just the start. The former school includes a renovated auditorium, new commercial kitchen, community library, food bank, ball fields, fitness center, cleaned-up classrooms and office space. Wasco School was built in 1916 at the corner of Barnett and McPherson streets, and was in operation for nearly a century. The two-story school is a historical fortress of Greek revival style. Built with fortified cement and covered with brick and stucco, the building was designed by Tourtellotte & Hummel. The architectural firm based in Boise, Idaho, created numerous Pacific Northwest landmarks, including the Idaho State Capitol, Hotel Astoria and the Baker City Tower. Throughout the years, the school taught children of all ages, from preschool to high school. In the late 1920s, the graduating class swelled to 28 students. In 1956, high school students were transported to schools in Moro, and Wasco School was used only for younger students. In 2009, fewer students meant consolidation. Wasco students were bused to Grass Valley, and the school was shuttered. In 2016, all area schools were consolidated into a single campus in Moro, known as Sherman County School. 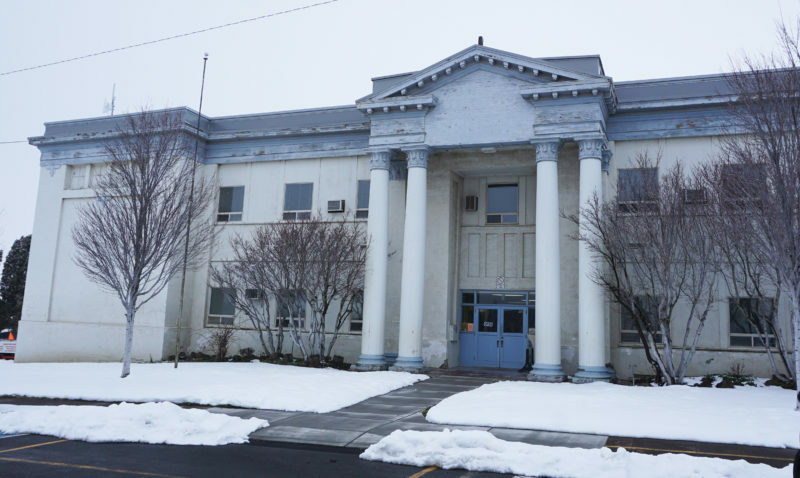 Wasco School briefly operated as the Sherman County Annex Building, but as the building suffered from deferred maintenance, talk of demolition began. A small group of local residents mounted a campaign to save the stately landmark. 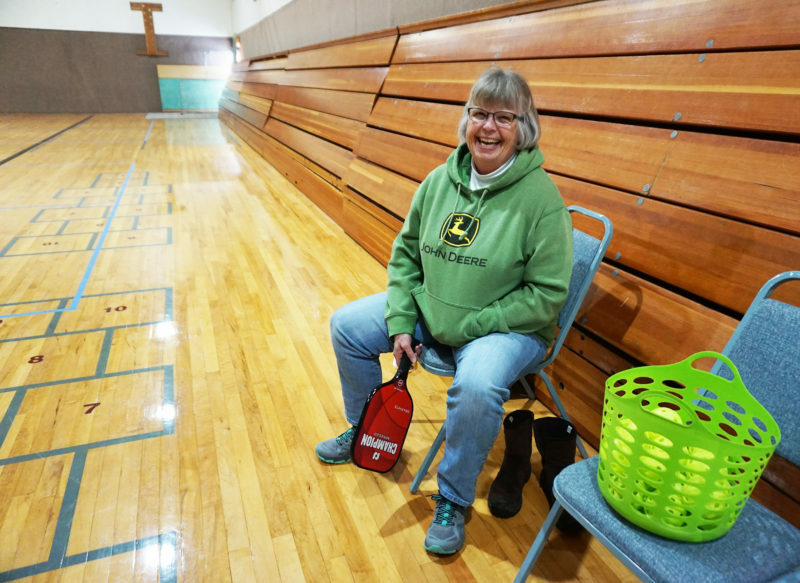 Carol Thompson enjoys playing pickleball at the former school that new features an auditorium, commercial kitchen, community library, ball fields, fitness center and gym. Carol Olmstead, who attended Wasco School in the 1940s and lives just a block away, championed efforts to save the building. The calls for preservation were heard. In 2017, the county gave the city of Wasco the building and grounds, which are now managed by the center’s board of directors. Sherman County provided $250,000 for renovations, along with $50,000 a year for five years. After five years, the Wasco School Events Center—a nonprofit organization fueled by one part-time director and a team of volunteers—must be self-supporting. To reach that goal, Melissa, the board of directors and other volunteers have worked countless hours to repair, drywall, paint, refinish, clean, manage and maintain the solid but neglected structure. The first job became the most important one: Fix the roof. Water had damaged the second floor classrooms. Next up was renovating the dilapidated library—a months-long project of sorting, clearing, cleaning and painting. The library now offers 5,000 new books. 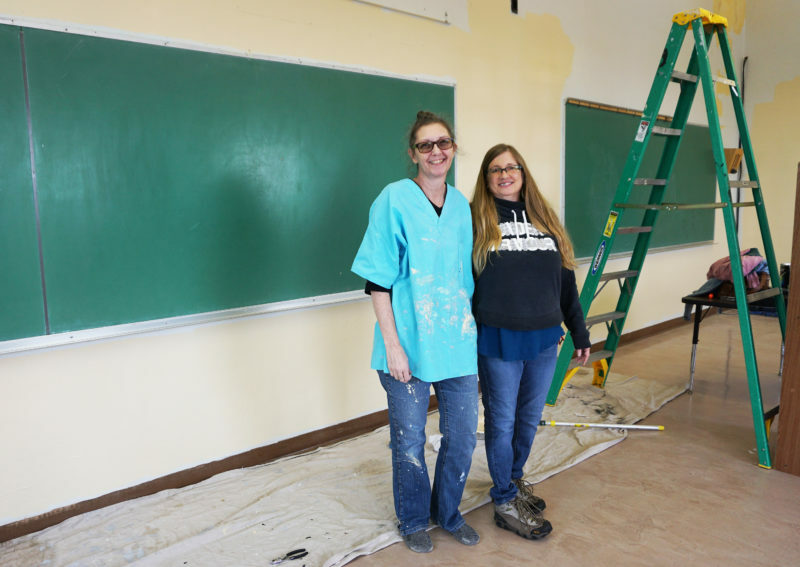 Jessie Fuhrer, left, serves on the board of directors and has helped clean and paint nearly every room of the Wasco School. Melissa Kirkpatrick, right, is the center’s director. The center’s board is a hands-on group, with each member taking an active role to ensure the center’s success. Members are Tom Lepinski, Carol Olmstead, Gail Macnab, Jessie Fuhrer, Linda Krafsic and Cal Mcdermid. While renovation efforts have consumed the past two years, daily operations are in full swing with a host of programs and activities. The center hosts dozens of events each year, including weddings, reunions, memorials, town halls, coffee hours, kids’ gym, bingo, fitness classes and community dinners. Classrooms can be used as office space or artist studios and are available for monthly rental. Other rooms—such as the principal’s office, auditorium, kitchen and gym—are available for as low as $10 an hour. Last fall, the center was asked to provide space for a youth diversion center for teens awaiting placement in suitable homes. The project would require a workforce of dozens of medical and mental health professionals, along with administrative and support staff. More details are needed and no decisions have been reached, says Melissa. “There are lots of variables,” she says. In the whirl of events and activities, Melissa says there’s always room for more people to take part in the transformation.